‘Jordan Cucumber’ consists of painted and rotting cucumbers. 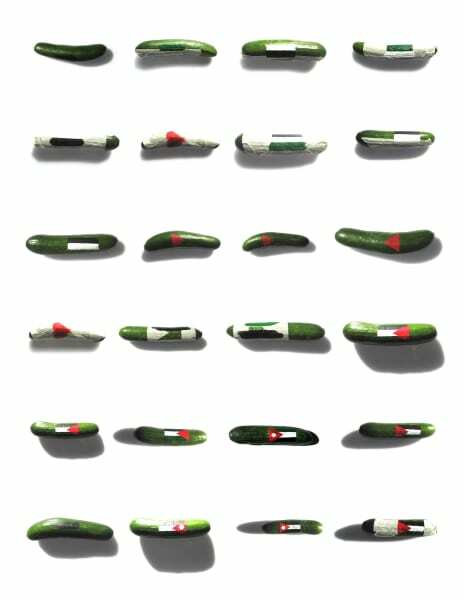 I invite artists, students, teachers, and any others, to paint Jordanian flags on fresh cucumbers. The painted cucumbers are fixed to a wall where they succumb to the process of decay. Some argue that there is no need to evacuate the West Bank settlements and indeed no need to create a state for the Palestinians in the occupied West Bank because a Palestinian state already exists in neighboring Jordan. Jordan granted most of the West Bank Palestinian refugees citizenship and is now a nation of six million people, divided about evenly between those from the East Bank of the Jordan River — considered original Jordanians — and those from the West Bank. The proposal by which West Bank Palestinians simply have to come to Jordan for all their problems to be solved is called the ‘Jordan option’. It’s a perennial idea floated by different political actors in the region in various forms: the term also refers to a possible Jordanian security role in the West Bank or a future form of unity between a Palestinian state and the Kingdom of Jordan. This option / cucumber wordplay is the starting point for the ‘Jordan cucumber’ project with the rotting vegetables reflecting the status of the Jordan option as a political possibility. The project premiered at ‘Makan Art Space’ in Amman, Jordan in 2010. Inspired by ‘Kill Khalid – the Failed Mossad Assassination of Khalid Mishal and the Rise of Hamas’ by Paul McGeough, The New York Press, 2009.